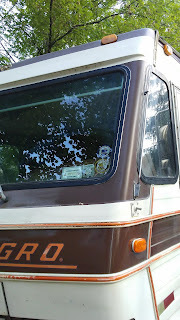 The Long Hauler: Vintage RV'ing: Bringing back that Shine!! 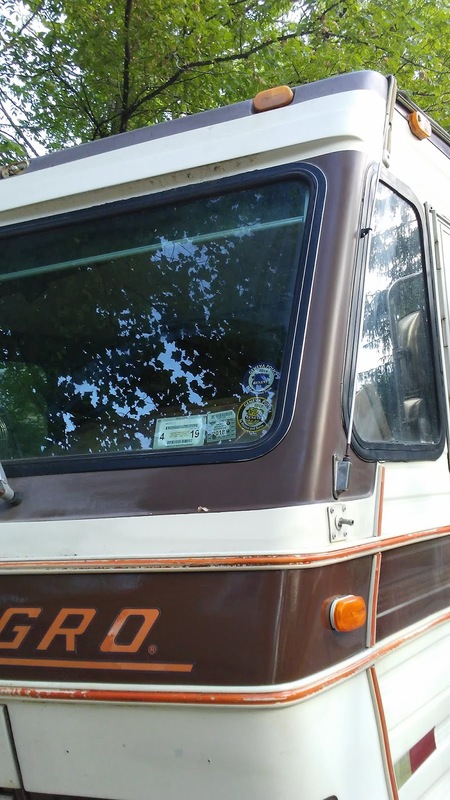 All of us vintage RV owners know that at some point the exterior finish, exposed to all sorts of weather and temperatures and UV rays tends to age and in the case of aluminum paneled RV's (which I think have it made over fiberglass panel RV's!!) the paint and coatings get chalky and dull. Now that's not so bad but when the white portions start to run down over the darker color trim bands that's when things start to look a bit used. What to do? You can clean it and clean it but at some point those aluminum panels will wear down the paint coating and you're left with a repaint. At this stage we have an Allegro that is not there yet but showing signs that a good go over is needed. 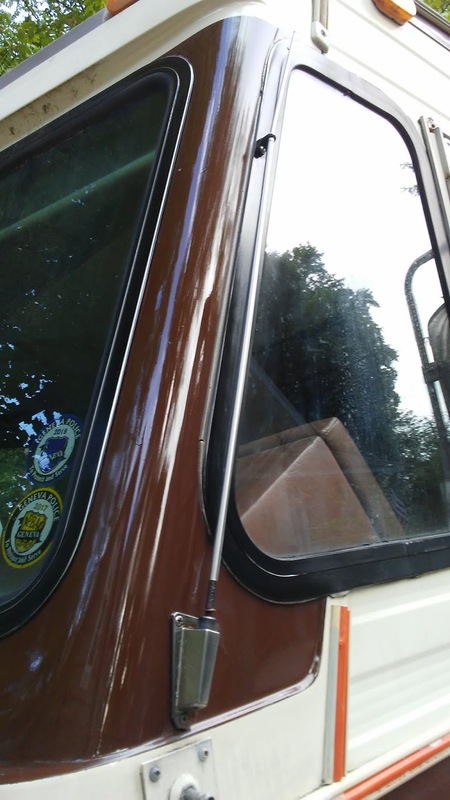 I'll share with you my technique to clean, prep and clearcoat my RV. The supplies consist of a set of cleaners to kill off the algae that grows on our rigs, cleans of the debris and also helps strip off the oxidized layers of the color coat. Now, you don't want to strip all the coat off, just enough that you get rid of the grime, algae and other foreign materials. The clear coating will help bond and preserve the remaining base coat. Unless you like the military drab look on your classic RV, then get ready to bring back the shine!! Steps I took to restore the finish (fiberglass and aluminum were separate). 1) take glass cleaner (Castle Glass cleaner or similar ammonia based cleaner, spray on) and cover the area to be treated. 2) use 4 O steel wool (0000 on the package) to rub off the oxidation without leaving marks on the fiberglass. I have NOT used power sanders because I don't believe they allow the control you need to stop before you sand too much off. 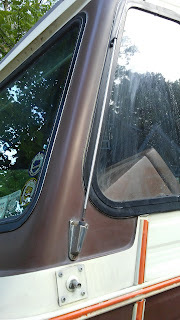 3) Respray with glass cleaner and use a clean rag to remove all residual dust. 4) Look over the panel to see that you got off any over sprayed paint, oxidation and other discoloration where you could. 5) Spray a light coat of clear coat over the area. It's really tempting to over spray now because you can see the improvement right away but with clear coat it will drip even more than paint. Keep with several light coats. You should not have to sand between coats unless you get a bad drip. Heck, I've over sprayed knowing the coat would just drip down and run off the bottom of the panel. 1) Glass cleaner sprayed over area and wipe off with rags. You may need chlorine based cleaners to kill off the algae that grows in the seams but DONT MIX these as you will get a version of ammonium chloride!!! I believe that is mustard gas. 2) use rubbing compound and rags and apply the compound to the rags, rubbing most of the compound on the area to be cleaned. Let it dry for a minute and start rubbing, using the compound as your abrasive to get off specks of bugs, paint chips, stains, oxidation, etc. from the panel. 3) use glass cleaner to spray and wipe off the areas with a rag or paper towel to remove all the compound. 4) Spray clear coating on the panel over several coats to get the even shine with a smooth finish. Here are a few pics of the work being done on the fiberglass front and aluminium sides.